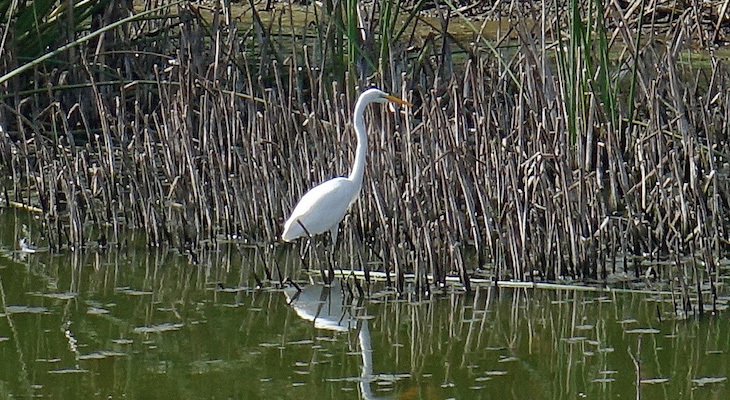 I recently posted about the Egret convention at Devereux Slough at Coal Oil Point Reserve near Isla Vista. This week I discovered a similar convention at Lake Los Carneros! But there is another gathering near the eastern end of the lake, close to the paved walkway and dam. Here they are not in a cluster. Rather a glorious, graceful arc. Arrayed around the edge of the shoreline! This one was hanging out among the ducks right at the shore and easy to see up close! I like how they pose with their reflection in the water! In addition to the egrets were the closely related great blue herons. This one rested close to the fence with its mouth open. Not sure what that was about. This one was coming in for a landing, looking a bit like a pterodactyl! Plenty of other birds out there as well. These birds were also doing the open mouth thing. I visited Lake Los Carneros Park three times this week and there was something new to see each time! Depending on where you're from, a group of egrets is referred to as a congregation of egrets. In addition to the raft of ducks or sort of mallards, the cover of coots and flight of cormorants. Or, the unseen volt of vultures and cloud of blackbirds, and, of course, what looks like a team of teenagers. What do eagles call Coots? Lunch. Thanks for the photos Mr. Bernstein, and thank you TAGDES for information. I wish more people would submit photos of their back yard birds, at feeders or bird baths, and describe them and their behaviors. What behaviors have you observed among species of birds? Thank you all for the kind words and thank you TAGDES for the very helpful information! Check out Lake Los Carneros, especially if you have never been there before. It is a gem every day. Right now that gem happens to be shining especially bright with these wonderful visitors! Thanks TAGDES--Whenever there's a gathering of living things, I wonder why. Beautiful birds, thanks. Wonderful information from TAGDES, thank you. Yes and there are also a couple of shots with Snowy Egrets showing the size comparison to the Great Egret and a few, if viewing the whole group of shots, of American Coots. The other and prettier blackbird found usually by the marsh bridge is the Red-winged Blackbird which also has a kind of distinct liquid gurgling song. The cormorant is drying his wings after fishing due to less preen oil in it's feathers than a duck but is not a liability as it allows faster hunting under water. Nice shots. It's called gular fluttering and they open their bills and vibrate their upper throat muscles and bones to to increase heat loss on hot days. Both the heron and these cormorants along with other members of the Ardeidae family do this because of their permanent down coat and lack of sweat glands in order to lose excess heat. Nice pix, and commentary too. Can I count birds on edhat in my sightings list?